I’ve been blogging this week about my participation in a physical computing and fabrication course at the Digital Humanities Summer Institute. 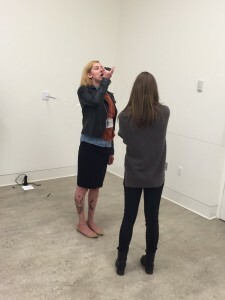 Our instructors have been the team of the University of Victoria Maker Lab, directed by Jentery Sayers. Jentery’s work in critical making and especially historical prototyping has fascinated me for years. My previous posts are about circuitry with Arduino and reflections on 3D printing experiences leading up to DHSI. I’ve also struggled to reconcile historical prototyping and making with other issues related to antiquities, some of which I’ve articulated here on the blog. Whose cultural heritage am I fabricating and remixing? To what extent do 3D models and reconstructions inform our understanding of the past, to what extent do they preserve threatened heritage, and to what extent do they perpetuate problems of Western colonization of Middle Eastern heritage? 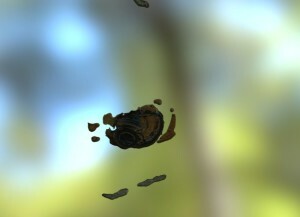 How do we visualize uncertainty about our models, because visualizing the past in virtual reality or 3D models often leads to the impression that we are “there”? Tuesday and Wednesday we played around with fabricating models. 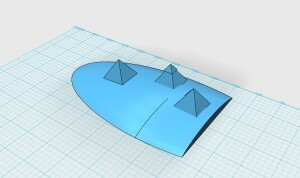 We used 123D Design to create 3D models of an object in a photograph we brought to class. I wanted to continue experimenting with modeling cultural heritage objects from the ancient Mediterranean. I realize this may seem hypocritical, given my previous blog post problematizing remixing cultural heritage. I also think I can’t really understand the process of making, reconstructing, remixing without doing it. (This perspective challenges the etic/emic divide in some of the methodology of Religious Studies. Quite a number of Religious Studies scholars posit that scholarship should remain external to our objects of inquiry–“religion”, people who practice and profess “religion”, texts and art that participate in discourses of “religion”. I think in the digital realm, becoming a critical practitioner can provide insights as well as the ability to communicate across different constituencies. So, before class, I planned to model either this Coptic funerary stela from the Metropolitan Museum in NY or the bracelets from the Pergamon exhibit there. 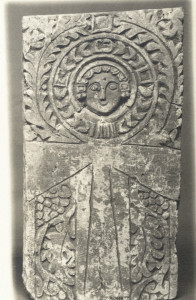 Coptic funerary stela, Metropolitan Museum. 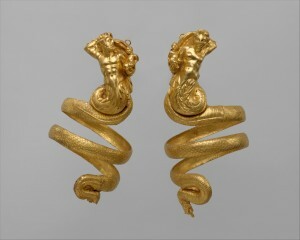 Triton armbands from ancient Pergamon. From the Metropolitan Museum’s special exhibit on Pergamon. As soon as I fired up our software, 123D Design, it became clear that the stela would be a bit boring as a form and complex as texture. And as soon as I tried to create forms in the program, it became clear that the bracelets would be impossible. I quickly shifted gears to reconstructing an image very familiar to me using simple forms — the Great Pyramids on the Giza plateau. But recreating something as basic as the slope of the hill eluded me. I became increasingly frustrated with the opacity of the software and my own ignorance of it. Add to that my complete lack of creativity …. But I chugged along, with lots and lots of help from the great Maker Lab folks, who provided detailed documentation and instructions for each day of class in addition to tons of hands on instruction and guidance. I finally modeled — sort of — the Great pyramids. We then imported our models into software called 123D Make and created models that we could physically fabricate. 123D Make allows you to refashion your model into stacked layers, curved layers, interlocking layers, or an origami model. It then creates plans for 3D printing those layers or paper printing the schematics for cutting the pieces of your model out of some other material — foam, wood, paper, etc. 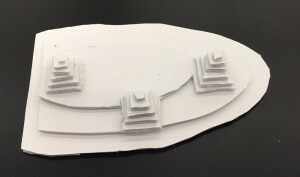 In my case, I printed out paper schematics of the a stacked slice model, put those pieces of paper on top of foam board, and used an exacto knife to cut out the foam. Voila! My pyramids. I thought it looked a bit like the Giza Plateau meets the Jetsons. Stacked layer Giza pyramids made from foam core. It was great fun seeing the creations of other students — an origami house, the space shuttle, a totally creepy face of a baby doll. 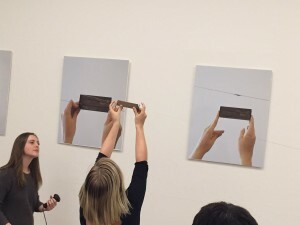 Plus we reflected a bit on the interplay between the physical construction and crafting of our work with the digital. Wednesday we experimented with other technologies to create 3D models. First we used photogrammetry — taking a boatload of pictures of an object — to create a 3D model in Agisoft software. Being away from home, I had nothing interesting to model besides my jewelry, and we were instructed not to bring something to shiny. So I modeled my Sony noise-canceling headphones. 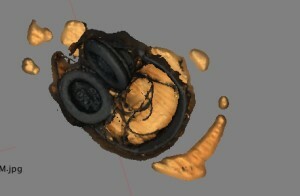 As you can see from the photo, even after trying to mask the images to select only the headphones, the software still modeled the surface on which they sat. My work resulted in some really creepy models when I imported the file into 123D Design and then into the online sharing site Sketchfab. After I tweeted about my failures in photogrammetry, Michael D. Press reminded me of the successes of this method in some cultural heritage work. The now destroyed minaret of the Great Umayyed Mosque in Aleppo has been modeled using photogrammetry. Some folks also tried scanning various objects using a true 3D scanner (where the object rotates on a plate while the scanner captures its form). I looked on while colleagues unsuccessfully tried to scan a red and yellow sippy cup with a Princess Leia toy (from a Kinder Egg) perched on top of the sippy spout, secured with play dough. Leia, however, refused to be quantified. The scans failed, especially around her head. I got a lot out of the exercise, especially as a process for requiring me to think more about the details of the historical object I was trying to model. The results weren’t so much in the model itself but in the way modeling forced me to think about the objects. I also learned quite a bit as I sought later to find code for 3d models of Egyptian antiquities on the web. As I posted earlier this week, the British Museum has a Sketchfab channel. I couldn’t find code to download a 3d model of one pyramid or the whole Giza plateau with a simple Google search, however. Nor could I find code for a reliable model of the Great Sphinx. I had fantasies of experimenting with putting Nefertiti’s bust on the Great Sphinx. Again, a basic Google search failed me — I found some models for pay and some not so great free models. And the free software crashed when I tried to import the “Nefertiti Hack” code, anyway. (The file was too big for the freeware to handle.) The University of Chicago Giza Plateau Mapping project from the 1990s hasn’t released their code. And I find the Harvard Giza 3d reconstruction project (on two different sites here and here) flashy but difficult to navigate and use due to plugins and the use of Flash. 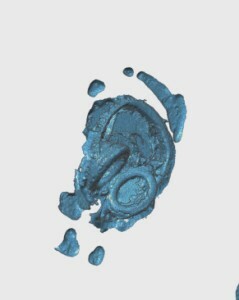 To come full circle, to my questions about fabrication and antiquities: perhaps thinking about the process of historical prototyping, rather than the outcome of the object, is perhaps a more productive and ethical way to work with antiquities modeling. My concerns about commodification focus on the object. Is it possible to focus instead on the process? 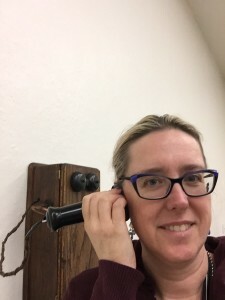 The Maker Lab has been prototyping 19th century devices, using archival material to recreate historical objects that are either lost or inaccessible. One great example is the current exhibit on Valdemar Poulsen’s experiments with impressing sound on a piano wire strung across his cabin. Poulsen’s invention and wires are lost. 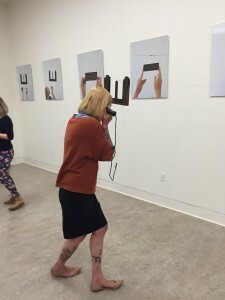 The Maker Lab researched them and fabricated a prototype, now installed as an exhibit at the University of Victoria. Mary Catherine Kinnibergh listening to the sound impressed on the wire. How can we who work in antiquity learn from this attention to process and prototyping, as compared to reconstructing and restoring. For Friday, in my class, in groups, we are creating projects pulling together multiple aspects of our work this week. It looks like the pyramids will make an appearance. More soon. This entry was posted in DHSI, Digital Humanities and tagged 3D reconstruction, cultural heritage, digital humanities, Egypt, physical computing, pyramids. Bookmark the permalink.